The Center for Venture Capital, Private Equity, and Entrepreneurial Finance along with the MBA Entrepreneurship Association, presents the Distinguished Speaker Lecture of Chris Rizik on Tuesday, October 3rd, from 5:40 to 7:00 in Room N105 of the Business College Complex. 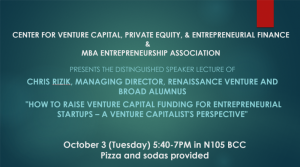 Mr. Rizik, a Broad alum, is the Managing Director of Renaissance Venture, and will present “How to Raise Venture Capital Funding for Entrepreneurial Startups – A Venture Capitalist’s Perspective”. Please join us this Tuesday for what should be a very interesting and informative presentation! Pizza and soda will be provided to participants. Be sure to visit the Center for Venture Capital, Private Equity, and Entrepreneurial Finance’s website for more details on this event and all the Center’s ongoing functions and activities.